PATERSON strikes me as AMERICAN SPLENDOR (the comic, not the film) for the beautiful people. The ones with artistic tendencies, who are old enough to accept the reality of a workday job but too young to be completely jaded about it yet. Adam Driver is no Harvey Pekar. Driver, a bus driver, goes about his daily routine, observing and absorbing life along his route — the characters, the conversations, the situations (like, being a driver named Paterson, driving through Paterson) — living a poetic life in every sense of the word. This film’s strength as a piece of art is that you’re able to project a little bit onto it. Some reviewers see this as a piece about a man moving through his poetic life, poetically, with a Zen-like focus on the infinite variety of subjects he encounters in his daily route. His passengers, fellow bar patrons, his artistic (if unfocused) wife and her dog are stops along his way which he soaks up and documents in his poems. And when Paterson’s life is disrupted in the one way it could be, he eventually comes to treat it as the momentary aberration it is, and his poetic equilibrium is restored. I see something different, though. I see an writer who never publishes, chafing a little against his good-enough routine but with little reason to change anything. And when he pays the price for this life, which then offers him an opening to make a change, here comes the poetic Universe in the form of a magical Japanese man to usher him back. And Paterson does go back, willingly, into that prison and closes the door behind him. SPOILER here, but I think it’s worth mentioning how this film was a lesson in establishing plot threads that aren’t wrapped up, but which totally works because those things aren’t what the film is about anyway. I was expecting a dog-napping, a smashed guitar, ruined cupcakes, a divorce, or a newly discovered twin. We get none of that, but it’s okay. Depending on your point of view, this is either a film about choosing to live a pure, artistic life for its own sake or it’s about condemning yourself to an existential hell that was ultimately of your own making. Either way is poetic to me. Slices of director Maya Forbes’ life growing up with a mentally ill father. Thankfully, Forbes does without with the typical “Act II breakdown” you see in most other films with mentally ill character. And it dispenses with the idea that mental illness is something delightfully quirky up until the point where everything collapses beyond repair. 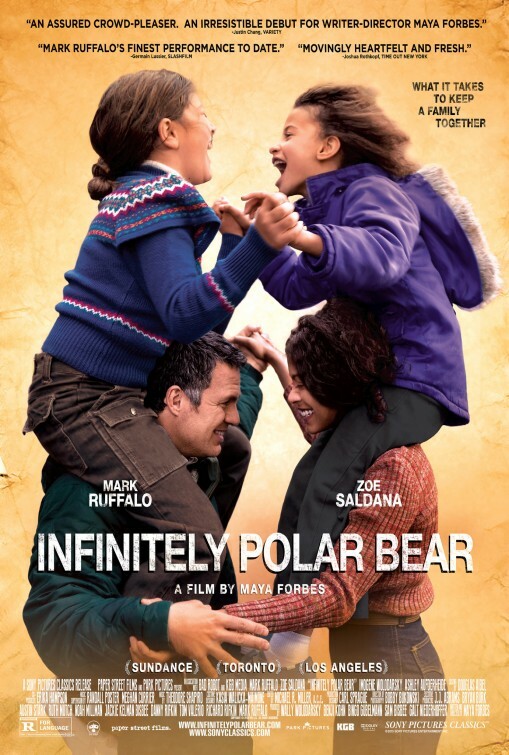 In POLAR BEAR, Mark Ruffalo’s bipolar disorder is pervasive, with good moments and bad moments, often occurring in the course of a single day. By the end of the film we get, as we sometimes do in life if we’re lucky, a brief respite from those ups and downs even as we know the next set will inevitably come. We also get to see how privilege can mitigate some of the worst social and economical circumstances. The Blue blood background of Ruffalo’s character absolutely is NOT his family’s salvation from its problems, something that we might see in a different film. It’s not particularly the cause of his problems either, even if it exacerbates them in a couple of instances. But it is shown (uncritically, which I think is okay since it’s not really the point of this movie) as the safety net that it is. I’m used to films and TV shows where mixed race families always seem to be fixed in a certain specifically defined socioeconomic status (usually one extreme or the other), and dealing with (or not) a certain set of racial issues – that is to say, families of caricatures. Here, we see a mixed race family in the ’70s presented in a very complex way, i.e. like real people. Forbes gives us the sense that if this particular White trust fund kid marrying Zoe Zaldana was ever an issue to the elderly Blue blood matriarch holding the purse strings, it’d been resolved enough that it needn’t have been brought up in this particular story. Which, even in the pre-Post-Racial 1970s, was something not entirely unheard of. Okay granted, maybe in the same way it was “not unheard of” for campers to encounter something big and hairy in the woods in the ’70s but still. I like the fact that Forbes doesn’t lazily caricature Blue bloods, either. What DOES matter to the Blue blood matriarch is Zaldana’s plan to advance herself to become a better breadwinner by temporarily abandoning her family to go to Columbia. Forbes never glosses over the fact that we’re talking about a Black woman here, but she does focus more on the problems of the traditional gender role. And while you might not like that choice – much like you can theoretically take filmmaker Anthony Chen to task for not being all that critical of the treatment of Overseas Filipino Workers in his 2013 work ILO ILO – you can only fault this filmmaker to the extent that you don’t buy that she’s painted an accurate picture of her life, more or less as she lived it. Whenever I watch films about artists with issues or peccadilloes (cf. JODOROWSKY’S DUNE, AMERICAN SPLENDOR, LOVE & MERCY, et al. ), I get this naive idea in my head that, “Of course, I don’t want to be as fucked up as that artist, but if I could just dip my toe into that pool of mad genius….” I think, “I have my dysfunctions too. But if I can somehow learn to leverage them somehow while keeping them dialed back just enough so I don’t implode, well then I can be brilliant without the train wreck, right?” Of course, the difference is that if I try, and then inevitably crash and burn, it would just be a clear case of pride going before a fall. When it comes to real artists and truly troubled artists, it’s not a strategy. It’s a very precarious way of life. This documentary doesn’t really provide much in the way of missing pieces that lead us to a better understanding of Winehouse’s trials and tribulations, or even necessarily to increased sympathy. 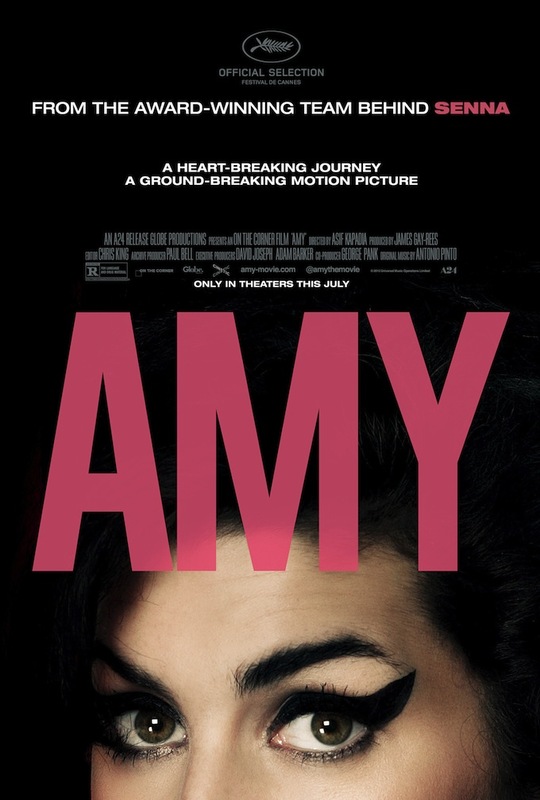 I don’t see AMY changing anyone’s opinions, for better or for worse. But I did learn a few new things. I learned how well documented life was in her circle. Because that’s just how the kids do things nowadays. I learned how soulful and penetrating her lyrics are. I had no idea. Luckily, the film literally spells them out for you. If Bennett likens her vocal chops to Billie Holliday’s, then her songwriting rates at least as highly as Cole Porter’s. And I definitely didn’t realize — if one accepts the film’s narrative, and I have no reason not to — how many times Winehouse came so close to pulling herself up out of the spiral. That’s the saddest part, to me. Not that she didn’t make her bad choices. But trapped as she was in the petri dish that is the music business, constantly under a media microscope, having started out with a life that came close to being as tortured as that of any other troubled artist you could name, what choices did she really have?